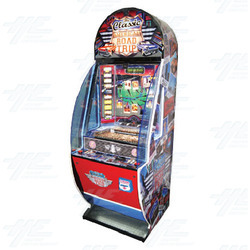 Classic American Road Trip is a bright and exciting coin pusher machine. This dedicated ticket payout, single player pusher is themed around the classic Hollywood to Chicago Route 66 and features a unique bonus feature that result in big ticket wins. At each destination players will light up postcards of the iconic location and get the opportunity to receive a bonus splash of coins that convert into greater ticket wins. On reaching the journeys end the player can win up to a 500 ticket bonus. At each destination players will light up postcards of the iconic location and get the opportunity to receive a bonus splash of coins that convert into greater ticket wins. On reaching the journeys end the player can win up to a 500 ticket bonus.